Home /Why Is the Structural Budget Deficit Blowing Up Since Trump? 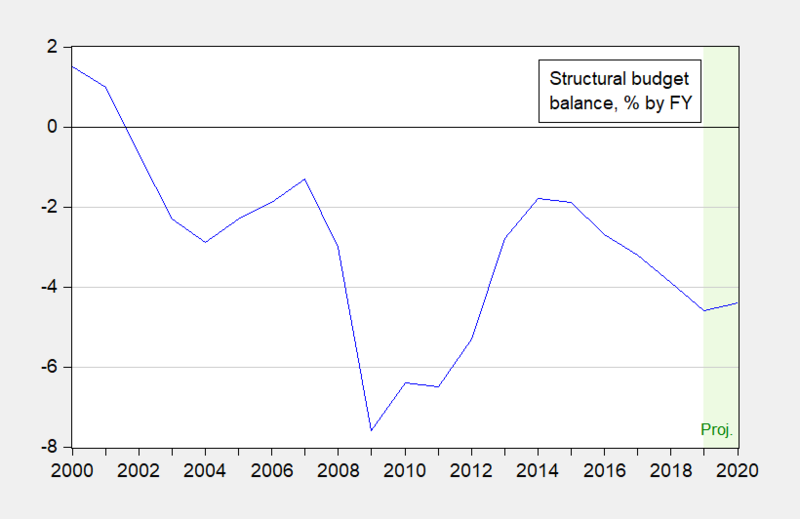 The structural, or cyclically adjusted, budget balance has been deteriorating. In accounting terms, what’re the drivers? Figure 1: Structural/cyclically adjusted budget balance as a percentage of potential GDP. Source: CBO, Budget and Economic Outlook, Jan. 2019. While I agree that the end of the spending restraints is partly at fault, my view is that thus far, the biggest cause of the deterioration is from the revenue side, and the failure for the Stephen Moore claim of a self-financing tax cut to materialize. Figure 2: Change in structural/cyclically adjusted revenues (blue) and outlays (red) as a percentage of potential GDP, relative to FY2017. 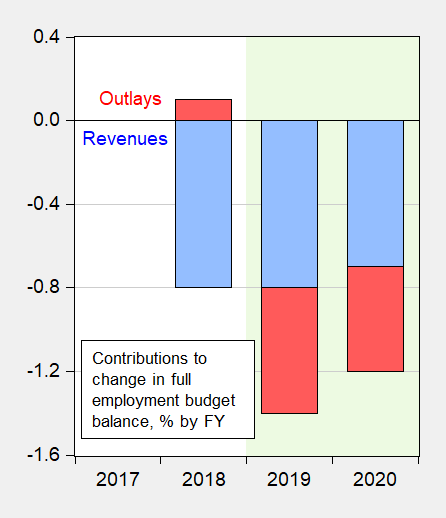 Source: CBO, Budget and Economic Outlook, Jan. 2019 and author’s calculations. This picture suggests to me that so far, it’s been primarily a revenue side problem, with spending side issues appearing in FY2019. Once again, looking at data is useful.